Though Shuttles Are Retired, NASA Needs More Astronauts, Panel Says : The Two-Way The longer missions of the future, the training needed to fly on Russian ships and other factors combine to create the need for 5 to 10 more, according to the group's report. 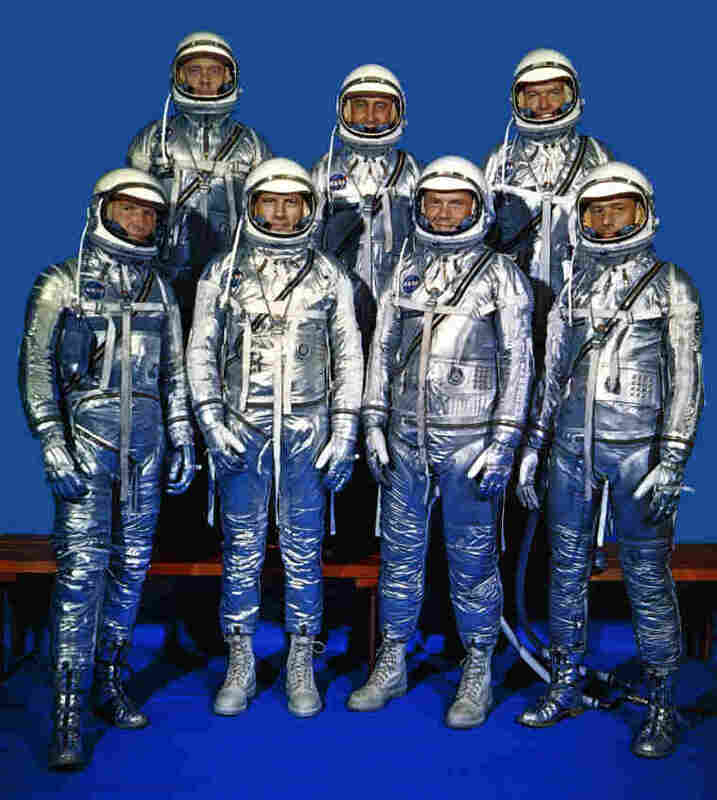 The Mercury 7, NASA's original astronauts, in 1959. More than 50 years later, the agency still needs astronauts — and in fact needs a few more than it has — a panel says. With the shuttles headed for museums, NASA will be flying fewer astronauts — only four to six will go up to the space station each year, for long-duration missions that last months. The agency currently has about 60 active duty astronauts. "Why did we need so many astronauts? That was what we went in basically questioning," says Joe Rothenberg, a former NASA senior official who co-chaired the National Research Council committee that examined the astronaut corps. He says, to his surprise, the committee found that NASA actually needs to keep a few more astronauts on staff. "We realized that they were taking some risks, or building some risks into the program, by not having enough astronauts," says Rothenberg. The committee did not recommend a specific number of additional astronauts that NASA should plan to keep on staff in the future, says Rothenberg, because factors like maintaining the right skill mix may influence that number. "It's less than ten. Maybe closer to five," he estimates. Long duration missions pose staffing challenges that are different than two-week shuttle trips. Astronauts need years of training to be ready to live and work on the station. They need to be familiar with laboratories built in other countries. And because the Russian space agency currently has the only spaceship capable of carrying crew to the station, American astronauts have to be trained to fly in it. Health requirements are more stringent for long-duration missions, and the report notes that 13 astronauts have become medically ineligible for long-duration missions after they were assigned to a mission but before they could fly — highlighting the need for an adequate number of potential replacements with the right skills. The report cites recent examples of NASA already having trouble in finding the right replacement astronaut in a pinch — for example, after one astronaut assigned to a shuttle mission experienced a serious bicycle injury. "This incident highlights that the Astronaut Corps is approaching a point where it lacks sufficient margin required to deal with unexpected personnel situations," the report notes. Plus, when astronauts return from a six-month stay in space, they may not re-qualify for flight, for medical reasons including vision problems, bone loss, or radiation exposure. Astronauts also have to be available to fill other important roles, such as working in Mission Control and training other astronauts. What's more, commercial companies are working to develop private capsules that could carry NASA astronauts up to the station. The agency wants those "space taxis" or "rental cars" to fill the old transportation role that its space shuttles used to play. Those companies will expect some involvement from NASA astronauts in developing those new vehicles. The number of active-duty astronauts working for NASA has declined dramatically in recent years — from around 150 in 1999 to around 60 now. And the committee notes that, in the coming years, NASA may see more astronauts than usual retiring, because of uncertainty about the future of spaceflight.